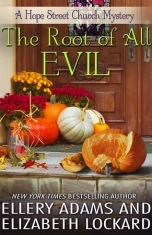 Elizabeth Lockard is the coauthor, with Ellery Adams, of the fourth and fifth books in the Hope Street Church Mystery series, The Root of All Evil and Fate of the Fallen. Elizabeth began writing in kindergarten, and her mother still has the first two-sentence story Elizabeth ever wrote. Though she’s been writing since childhood, Elizabeth always thought of writing as a hobby rather than a profession. However, after working in the communications field and gaining more writing and editing experience, she turned her full attention to her oldest love—the written word—and decided to make a career of it. 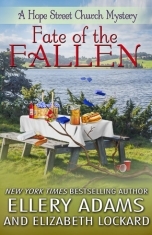 Her favorite authors are Elizabeth Peters and Krista Davis, but she enjoys most books with mystery and/or thriller elements. A game geek, Elizabeth spends much of her nonwriting time challenging her husband and friends to various board and deck-building games. She also enjoys photography, reading, and designing her own board games. Elizabeth lives in Phoenix with her husband, son, and two dogs. She also writes under the names E. M. Lockard and L. Haven Everett. For more information, see her website at emlockard.com.